I usually do resolutions that I vow to NOT do for the new year. So here are mine for 2015! I resolve to NOT....stop hating the word selfie. And bae. Awful words. I resolve to NOT....stop eating my delicious McDonalds. The fries make me happy. I resolve to NOT....stop being annoyed that our troops are paid so little. I resolve to NOT....vow to lose any weight. It might happen. It might not. I like my sweets. I resolve to NOT....stop watching crap reality TV. It entertains me. Celebrity Apprentice starts on January 4th. I'm rooting for Brandi. Or Gilbert Gotfried. I resolve to NOT....stop laughing when someone farts. It's funny. I resolve to NOT....start doing Yoga. It's not for me. I wrote a blog post on why I would never do it. If someone farted when bending over, I'd DIE with laughter. What do YOU resolve not to do? I love that you make not resolutions. I could make many like that! I love these. They put a new spin on traditional resolutions / goals! Well I love yoga, haven't gone to McDonalds in at least 12 years, really don't care about slang words, don't watch TV, eat pretty clean...I think you see where I'm going here ;). But there is one I stand up and applaud you on and couldn't agree more...I look forward to the day we care more about the men who protect this country than the men who protect a football. Oh and yes - good luck finding your publisher! Yes, she/he will come. I often see publishers looking for new authors on Twitter! Ohh I love this! I should have done this instead of my 'Goals' haha. I too, hate the word Bae. WHY?! Just WHY?! It's like you read my mind! lol I'm coming around to selfie, but BAE makes me crazy! Plus ... reality TV and McD's fries are like my ideal Friday night! Love this post!! Selfie doesn't bother me as much as "bae" does... I actually saw a post on Facebook where someone said that "bae" means poop in I forget what language and that literally made me laugh out loud. love it. I am gonna make some Not resolutions. Although yoga has helped me a lot - but I certainly never, ever in a million years pictured myself as a yoga person. Not at all. my old body needs the flexibility help though now. but the day a fart is not funny - you might as well just lay down and die, because really? what else is there then? I still need to come up with some "resolutions," but I def like your spin on things "NOT" to do!! I resolve to NOT set any resolutions. I may have a goal or two to work on, but they really have nothing to do with the new year of 2015. 2015 isn't going to help the goals be met. What a great perspective on new year's resolutions. I have a list of things I don't want to do either, like eating McD fries. So cool you self published! I love this and agree with so many of them! Especially the farts. I can't help it. It will always, ALWAYS be funny! You also know that I love my trashy reality TV! Haha. This is awesome. I resolve to NOT stop watching chessy romantic Hallmark style movies. I love those things! 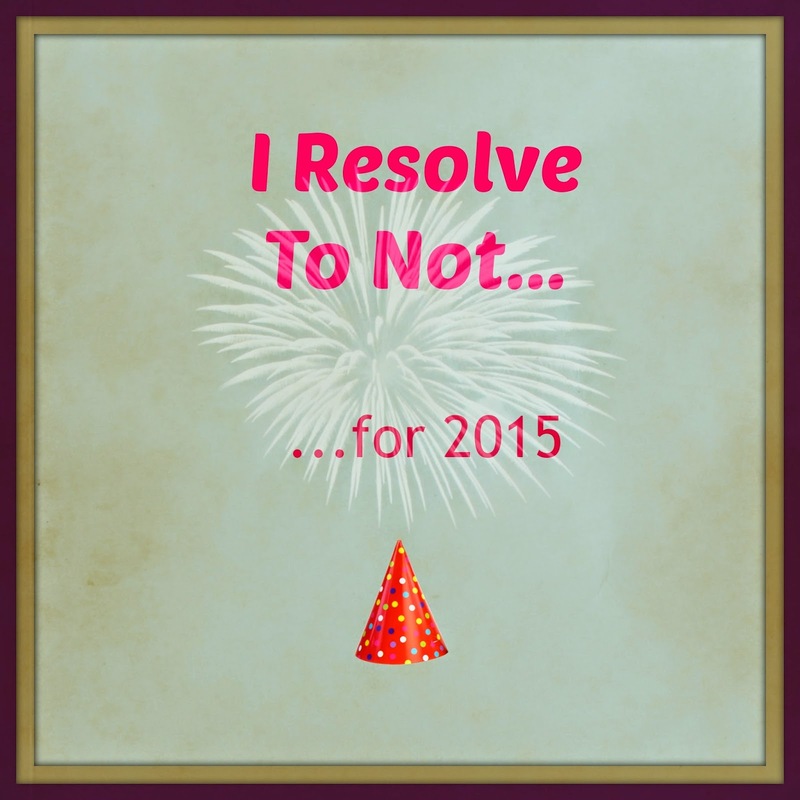 I'm with you - I don't do resolutions!! And, I CAN'T wait for Celebrity Apprentice - it has been far too long!!! These are awesome! I ate my fair share of McD's french fries on our roadtrip! And I can't wait for the new season of The Bachelor! I agree with the first one! I don't mind 'selfie' that much, but 'bae' is just horrible. Do you think people fart at yoga? I don't think I could handle that. I would definitely run out of the room laughing. And I still haven't figured out bae, for good reason! What does the word "bae" even mean? Have we already had this conversation? I resolve to NOT ever stop watching The Bachelor regardless of how douche he gets or how stupid the girls are. I resolve to NOT feel bad for not wearing makeup in public. I resolve to NOT create huge adorable gift baskets for teachers and bus drivers and teacher assistants and lunch ladies. You get a handmade card from my kid. Deal with it. I am with you! I HATE YOGA! You and I are so alike. I love it! Good for you! Keep doing what you enjoy. I resolve to not stop dreaming of traveling again. Also, to not stop eating Talenti gelato because it is the best thing ever. I will only do yoga poses in private.